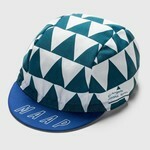 Els Angels cap is a limited edition cap designed to celebrate our ride in Girona, Spain with Eat Sleep Cycle. This custom cap is a part of a collection of caps from our In the Field ride series – a specially curated group ride in collaboration with your local shop where we take a new look at a familiar route. Style and performance, together, in our classic cotton cycling cap. Designed in our signature fit for comfort, the Els Angels Cap is made in Italy and features an anti-bacterial internal sweatband.